Brand management is like training a dog. Or anything for that matter. Start in the right way, follow a number of principles and the brand is manageable. Ignore those well established principles and the brand becomes an out of control dog – hard to manage, hard work and barking at all the wrong times. OK, so its an analogy of sorts, but how do we get a manageable brand. Successful, strong branding embodies the personality and values of the organisation, the ideas, the products and services. Public Impact works with the culture of your organisation to create brands that embody the personality of business, the benefits of products and the aspirations of customers and supporters. Our collaborative approach to projects promotes internal buy-in, our creativity and business skill creates visually exciting and practical, manageable identities. Strong corporate brands and the creative design at the heart of their presentation will be underpinned by a strong set of brand values. Brand values need to be realistic, sustainable and properly express the personality of the business. To an external eye are the brand values of the business in step with the outputs and customer perceptions of the organisation. Where brand values already exist Public Impact works with them. Otherwise our consulting and facilitating helps you better define your brand values and to achieve buy-in throughout your organisation. Public Impact provides a programme of consultation, workshop session involvement, definition and feedback, brand management training and mentoring and managed roll out programmes. Underpinned by Public Impact’s brand consulting services, the creative design of brand identity puts in place visual and verbal elements that define the brand. Logo design, strapline development digital design and graphic design services all contribute to the development of strong, positive brand identity. Effectively defined, comprehensive brand guidelines are essential tools in the management and projection of brands both within the organisation and to the wider market. Public Impact helps marketing directors and brand managers by developing and providing clear, workable brand guidelines that are easily understood and encompass all the information creative teams and third party suppliers require. Comprehensive formats are portable and easy to use across the range of digital and traditional media including print applications, signage, point of presence/sale, digital media and web design. 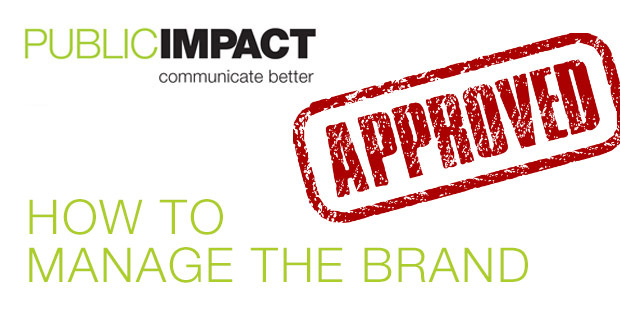 Managing brands requires a degree of skill, visual understanding and strong methodology. It’s about more than just policing the brand, it’s about creating effective platforms, establishing effective channels and disseminating best practice. But most of all effective brand management is about creating and maintaining a brand culture within the organisation. Businesses can struggle with brand management for want of the right techniques and processes and effective brand definition is a prerequisite. Public Impact’s brand management consulting and training equips businesses of all types with the right approach to ensure the brand is effectively managed both internally and externally. Our brand strategy development review and audit processes provide the basis for a strong ongoing partnership driving the progress of your brands.